S.G. Gaskets & Cooling Towers Co. The double-jacketed corrugated gasket is an improvement on a plain jacketed gasket in that the corrugations on the gasket will provide an additional labyrinth seal. It also provides the advantage of reducing the contact area of the gasket, enhancing its compressive characteristics. A double-jacketed corrugated gasket still relies on the primary seal on the inner lap. 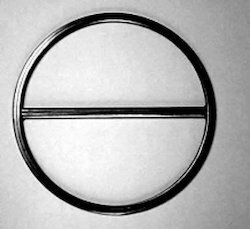 Matching up with the exact requirements of customers, we are involved in presenting a wide array of Double Jacketed Gasket (Double Jacket Ring Gasket). HEM's Metal Jacketed Gaskets are ideally suited for smooth surface applications including heat exchangers Valve Bonnets, Gas Mains, Vacuum Lines, Autoclaves, Boilers and Glass lined Equipments. Use on circular or non-circular application, requiring 20 to 30% compressibility to compensate for flange misalignment, wrapage etc. In the single-jacketed overlap construction the maximum flange width is approximately 1/4". 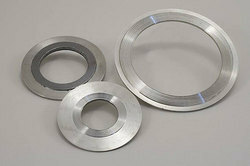 this type of gasket is used when total enclosure of the soft filler material is required and when the flange width makes it impractical to use a double-jacketed gasket. Available at market leading prices, we offer a wide collection of Jacketed Gasket to our invaluable clients. These products are designed with the assistance of experienced specialists, who make use of quality tested raw material to manufacture the entire range. Our range is used on application where poor & pitted flanges exists and temperature is high. A gasket with a metallic outer shell and either a metallic or non-metallic compressed fiber filler is Metal Jacketed Gasket where the filler material offers resilience and metal jacket protects the filler and resists pressure, temperature and corrosion. FEATUREFabricated with Non-Metallic filler inside such as ASBESTOS, GRAPHITE, CERAMIC, NON-ASBESTOS, etc and is covered with metallic sheet such as SS304, SS316, COPPER, BRASS, etc.